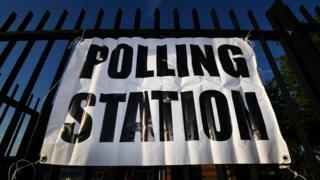 The UK faces a "perfect storm" of threats that could put its entire electoral system at risk, the head of the elections watchdog has warned. Russian meddling on social media and local council cuts were just two of the factors threatening the credibility of the system, Sir John Holmes said. He told BBC Radio 4's Today programme Britain's electoral laws were a "mess" and needed to be updated. He will set out the steps he says need to be taken in a speech later. The Electoral Commission has launched an investigation into allegations of Russian interference in last year's Brexit referendum and the general election. "It would be naive to assume that what we know happened in the US and France around their elections did not and could not happen here," Sir John told Today. "And there has been evidence coming from the US inquiry that some of that activity was happening. "What we have done is asked companies like Twitter, Google and Facebook to tell us what was happening here in the same way they did in the US." Responding to Sir John's comments, a UK government spokesman said: "We have one of the most robust democratic processes in the world - one that is not vulnerable to international malicious influence. However, this government is not complacent and we are already undertaking work to strengthen our electoral process and ensure it is fit for the future." In the US, both the House and Senate intelligence committees are looking into allegations of Russian interference in the 2016 presidential election - something the Kremlin strongly denies. Congress has released images of social media posts alleged to be Russian propaganda. Sir John, a former diplomat who has served in Moscow, said it was "impossible" for the Electoral Commission to "regulate or prevent what Russia is doing". But he wants new rules requiring political campaigners to identify themselves to give voters "transparency about who is trying to influence them, who is paying for it". He also wants to see photo IDs introduced at polling booths, following allegations of voter fraud in Tower Hamlets, in east London, and other areas. Critics say the plan discriminates against people on low incomes who don't have photo IDs. But Sir John said they could be given free photo ID cards, as was already happening in Northern Ireland, where the new system is up and running. He ruled out a move to online voting, because of concerns about hacking - but he wants it to be made easier to check online whether you are registered to vote. He also wants bigger fines for political parties and campaign groups that try to get round spending limits. The watchdog has repeatedly complained that it lacks the teeth to tackle abuses of the system, with Sir John warning some well resourced parties could see fines as "a cost of doing business" after the Conservatives were fined £70,000 for breaking the rules. He has also warned that cuts to local authorities could undermine the proper running of elections in the UK. June's general election had been generally well run, he said, but "returning officers and electoral administrators face reduced resources and a growing number of skilled professionals are leaving local authority elections teams". Prime Minister Theresa May has accused Russia of "planting fake stories" to "sow discord in the West", although Foreign Secretary Boris Johnson told MPs last month he had not seen any evidence of Russian interference in the Brexit vote or general election. Researchers at the University of Edinburgh found more than 400 fake Twitter accounts attempting to influence UK politics out of 2,752 accounts suspended by Twitter in the US. The accounts were believed to have been run from the Kremlin-linked Russian Internet Research Agency (IRA). The Commons Culture Select Committee is carrying out a separate inquiry into "fake news", and Britain's intelligence and security watchdog is facing calls to investigate whether Russian "troll factories" interfered in UK politics.